Easy to operate and easy to read, the BD-10 measures moisture in wood and other non-wood building materials. For those who prefer an analog display, the BD-10 is a great alternative to the digital BD-2100. The BD-10 is a great entry level meter, and is ready to go with a single button press! 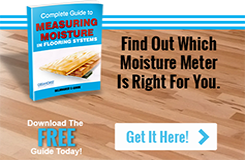 Wood Scale - 6% - 40% moisture range. Use for flooring and building material such as wood studs, floor joists, subfloors. Reference Scale - Reads from 0 - 100 on a relative basis. Use on non-wood materials such as concrete, plaster, and insulation.